Anyway, we got up and around in record time this morning. I think we are just starting to find a rhythym. 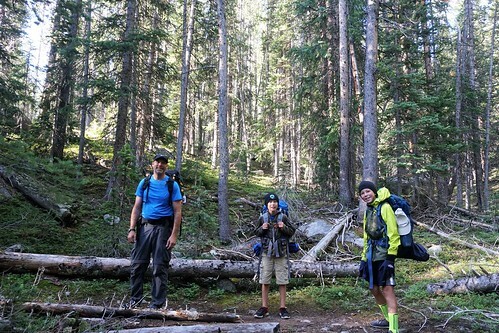 Everyone stashed a few starbursts in their pockets and we were on the trail a little after 7:30. We were pretty sure we’d make it the 6.5 miles to the car and the end of section 10 today. Yesterday I had misinterpreted the map and told the boys that there were no more major uphills…it would all be downhill to the end. I was wrong. 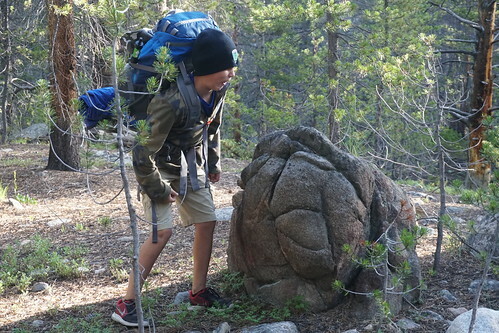 Joe corrected me last night when he looked at the maps but Dacen, while having his pity party about not climbing a 14er, didn’t hear the correction and was surprised at the long uphill we had first thing this morning. However, it was a beautiful climb and Joe presented us with our next homework assignment: our bucket lists. Build/fix-up a camper as a completely off-grid rig. With the skills from that I’d like to build a little off-grid cabin somewhere. Travel the country in our rig promoting a ministry where churches offer RVers free overnight parking. When you ask someone where an RVer can park for free overnight I want the common answer to be ‘the local church’ rather than ‘Walmart’. Live in a Spanish speaking country for an extended period (maybe 6 months or so) to serve the local community and to become more proficient in Spanish through immersion. I’d also like to eat avocados everyday! Ride my bike from coast to coast on the Trans America Trail while Steph follows along in our off-grid SAG wagon. 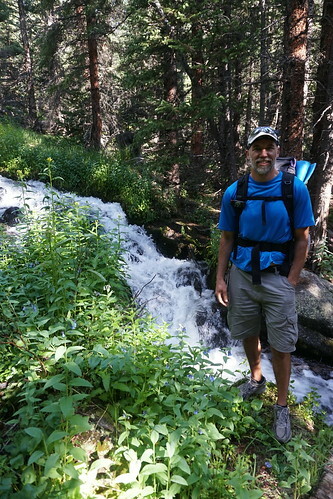 And/or do a 7 day self supported bike tour of Colorado which includes bagging a 14er (on foot). It was great to hear everyone’s bucket list items. Several of the items the boys mentioned had to do with travel, adventures and outdoors which warmed my heart. 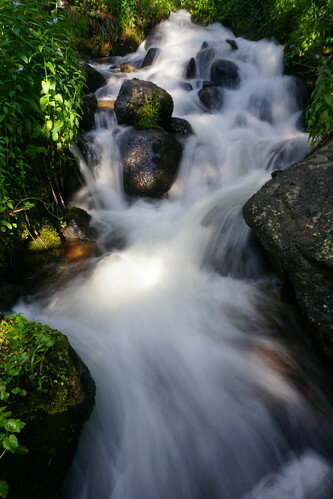 We continued along the trail at a very quick pace as our bodies were beginning to adjust to the rhythm of daily hiking with a load. Our muscles were starting to get the hang of it. Or, maybe it was that burger calling to us! However, since we were finishing a day early that meant we had extra homework today. 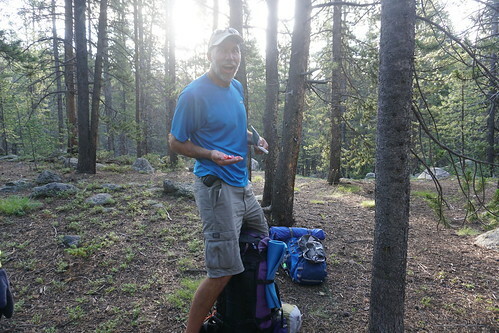 Our final assignment from Joe was to think about one thing you learned on the trail and one action you will take when you get home because of that lesson and/or to take the first step towards one or more of your goals. As usual you get to read about mine here. Before we knew it we were at the high point on today’s trail and we began our final descent to the car. 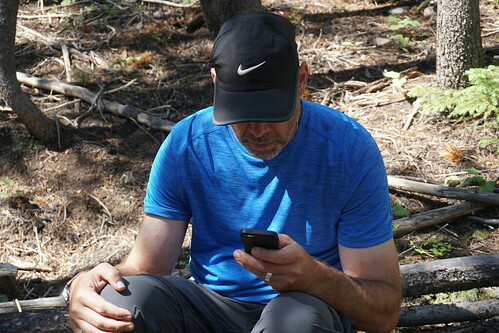 We passed the Mt Massive trail turnoff, crossed creeks and passed through meadows moving at a quick pace despite the increasing temperatures. Caden was in the lead and we were all deep in discussion about something when all of a sudden we were stopped by a giant fallen tree blocking the trail. It was clear that other hikers had crawled underneath the behemoth so we did the same. But on the other side the trail started feeling not so well traveled. Despite Robert Frost’s recommendation we decided taking the road less traveled seemed sketchy and we’d best retrace our steps and look for the other, more traveled one. About 20 yards back was a switchback in the trail along with several rocks and logs to block the path that we had taken. That’s right, all 4 of us stepped over the blockade and completely missed the very obvious switchback!! 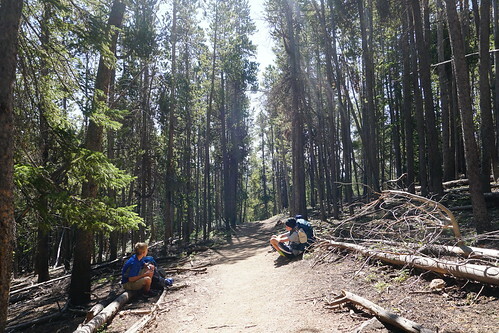 We laughed about our mistake but also noted how easy it was to miss the trail in perfect weather and trail conditions. How much easier it would be to lose ones way in less ideal conditions! 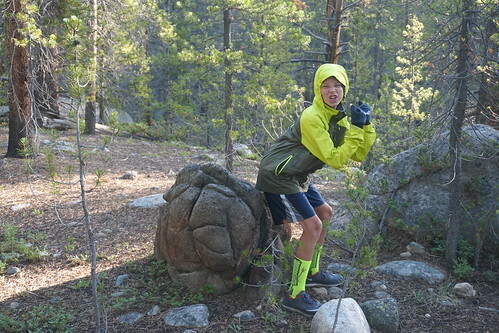 We bombed down the steep hill and arrived at the Mount Massive trailhead, the end of section 10, about 11:00! 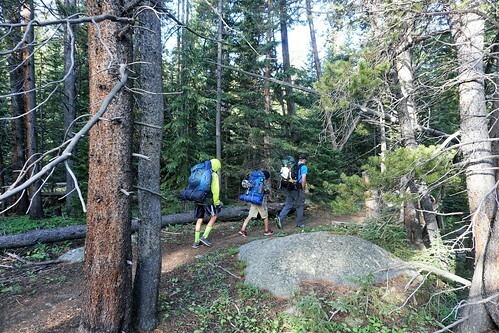 It felt so good to know that we had hiked some 27 miles over the past 4 days living with just what we carried on our backs! 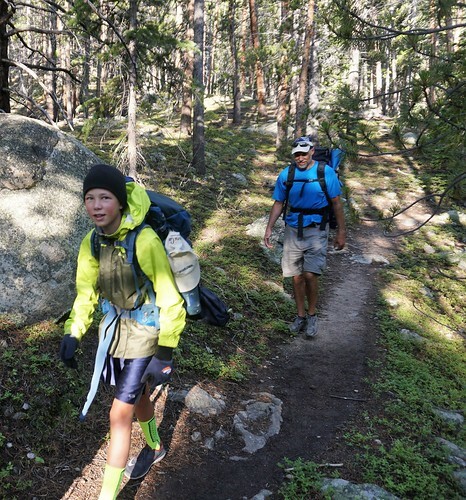 We had covered only about 5% of the entire Colorado Trail…but that was more than any of us had done before. 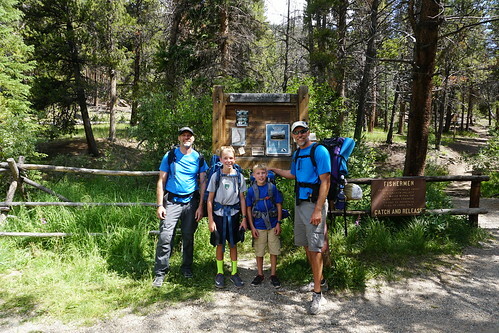 We got another hiker to snap a picture of us at the trailhead sign and then changed into clean shirts for the ride to Leadville. Can you hear it? 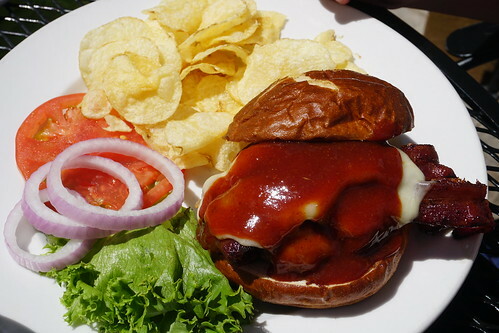 Those burgers are calling our names! Our shuttle driver had recommended the Tennessee Pass cafe and so we set our sites on that. 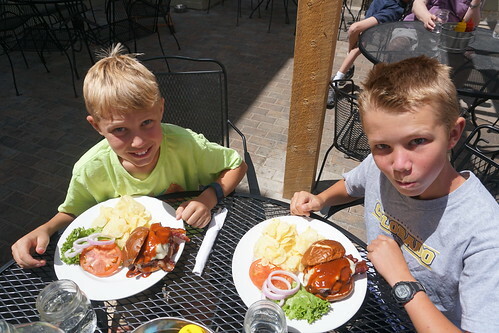 We found it right on the main drag of Leadville and scored ourselves a table out on the patio. We ordered big and messy burgers…and we ate every last bit of them!!! The drive home went pretty quick until we hit Boulder. But even that wasn’t too bad and we got home mid afternoon and began the long process of unpacking, drying out tents, laundry and cleaning our gear. The trip was an absolute success. We all stayed safe, we stayed healthy, we ate well, we slept well, we hiked hard, we played hard and we were able to enjoy one another’s company in God’s amazing creation. It was awesome!! Have a look at our final pictures of the trip here.